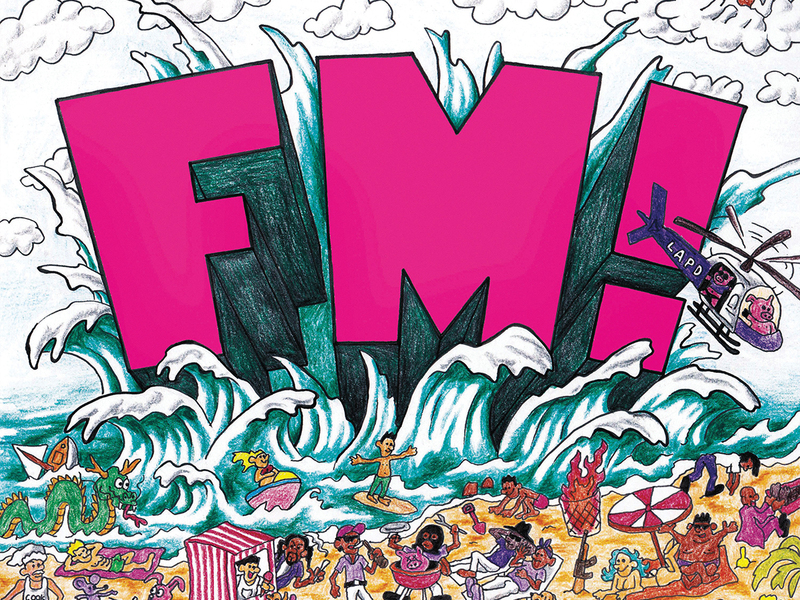 Throw on your sunglasses and get your speakers ready because Vince Staples’ crip-walk-inducing rap project, “FM!,” is the ideal album for blasting at your local barbecues – that is, if you can wait until next year. “FM!” is your quintessential, West Coast rap album that many will find one of Staples’ most catchy and head-bumping albums to date. But what lies beneath the blaring 808’s and bassy-synth melodies, is a clever criticism of his audience and the distractions that blind them from understanding the gang-violence and injustice that is prevalent in inner cities, like that of Staples’ hometown, Long Beach. On its surface, “FM!” is fairly simple. It’s a summer-themed album with allusions to one of modern music’s oldest and most popular mediums, the radio. With hard-hitting West Coast instrumentals and infectious melodies, it’s hard not to enjoy “FM!.” Songs like “FUN!” and “Outside!” epitomize this sound in every single way, starting with Staples’ laidback cadence and synth-focused instrumentals, as well as some 808 snares. For Staples in particular, these songs are a breath of fresh air, as he is known to focus more on dense, layered lyricism than creating a widely appealing sound. “FM!” proves that he is capable of balancing both, as he displays on the aforementioned tracks which are marked by the cheerful, happy-go-lucky mood you would want on a summer album. Which works in tandem with Staples’ vocals and melodic choruses, making sure these hooks get stuck in your head. Besides the makeup of each individual song, Staples’ composition of the whole album also seems to play into this focus on surface-level enjoyability. “FM!” jumps from tracks containing visceral descriptions of Vince’s life to little interludes that contain no real relevance to his prose. With initially head-scratching additions of “New earlsweatshirt – Interlude”, “Brand New Tyga – Interlude”, and “(562)-453-9382 – Skit” that play on the radio theme, rather than focus on Vince, seemingly forces listeners to snap their attention to Earl Sweatshirt releasing a new song, Tyga being a walking “L,” or more literally entirely overlooking Staples as a person, as seen in “(562)-453-9382- Skit.” With a focus on superficial enjoyment, and having himself overshadowed by the features in his interludes, it’s clear what Staples’ motives are. The intentions of this crowd pleasing album aren’t to forcefully appease the masses, but to expose listeners for their naivete in how they perceive music. Staples acknowledges that it’s not his raw emotion and graphic imagery that most fans will rave about, but caring more so about how the track sounds at a party. This sort of impressionability is epitomized both by the aesthetic of the individual tracks, as well as the album’s construction which, with its nonlinear focus on Staples, belies that it’s ultimately about his life. “FM!”’s catchy hooks and eye-catching beats are just the tip of the iceberg, with its true meaning lying entirely under the surface. From the fun, yet socially critical songs (“FUN!” and “Outside!”) to a lighthearted, yet confusing addition of radio skits and the almost obsessive emphasis on summer for an album released in November, “FM!” first seems like an one-dimensional album that can only be perceived by its upbeat nature. This could not be further from the truth. Despite every track carrying a peppy, playful tone, the lyrical composition of it ranges from Staples needing to keep his head on a swivel for the violence that surrounds him, to telling a story on the murder of his peers and the murder he needs to reciprocate in order to stay alive. “FM!” isn’t a critique about Staples’ surroundings, but the lack of seriousness towards violence and hardship. While Vince is forced to endure and experience these strifes, fans are allowed to blast songs like these and bump their heads at their barbecue, not actually caring about the subject matter that he is discussing. “FM!” isn’t the summer album that was released a few months too late. “FM!” is the album that chastises those who can live their lives treating every day like it’s summer, with no recourse, consequence or fear of their environment, playing the radio and having fun listening to someone like Vince pour out their trauma in their own safe spaces. Verdict: “FM!” is one of Staples’ strongest albums to date. Despite layered meaning and an underlying focus on theme, Staples doesn’t sacrifice sound whatsoever and has shown for the first time he can balance musicality and social commentary in an enjoyable way.